A 79-YEAR-OLD woman has been jailed for three months for trespassing on the runway at Shannon Airport. Margaretta D’Arcy is an anti-war activist and a well-known writer from Galway. She refused to sign a bond to uphold the law for two years and stay out of unauthorised zones at Shannon Airport, a move which the court told her would have suspended her sentence. She will spend the next three months at Limerick Prison after being arrested in her home in Woodquay, Galway yesterday morning. Margaretta was convicted in December along with fellow activist Niall Farrell after Judge Patrick Durkan heard they endangered lives by blocking two flights from landing at Shannon in October of 2012. Niall Farrell spoke to TheJournal.ie and raised his concerns about Margaretta’s health. She is currently undergoing cancer treatment and he said “the big question is how are they going to be able to deal with her needs?”, adding that “arresting her is an outrage”. D’Arcy was married to the playwright John Arden who died in 2012. President Michael D Higgins spoke at John’s funeral about his close friendship with the couple and has been called on to assist in the current situation. We’ve called repeatedly on President Higgins to reiterate his anti-war stance and due to his friendship with Margaretta, we think it would be appropriate for him to visit her in prison and acknowledge her situation. Email “79-year-old jailed for three months over Shannon protest”. 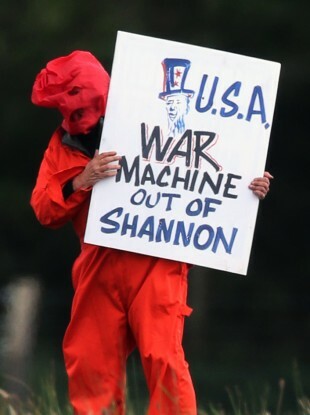 Feedback on “79-year-old jailed for three months over Shannon protest”.